When will the British learn ? Dirty politics in India - is their a bottom to the pit? This must be one of the most reluctant posts that I have written. It is almost a compulsive one. Nearly 150 lives were lost in the train accident in Bengal. On one hand, I was glad that there actually were helicopters carrying the injured to hospitals. Otherwise, one always wonders how in USA helicopters are always present to rescue people. So it can happen in India too, I said to myself. Barely 48 hours later, I see the ministers divided in their opinion about how the accident happened. I am OK with people having different opinions, but can they hold their tongues for some time? Mamta Banerjee has hit her all-time low by claiming that this was a result of 'political conspiracy'. How insensitive can one get? It is no surprise that this statement comes with WB civic body elections around the corner. The last time she did this was when she raked up the Singur controversy. Clearly, she was keeping the oncoming general elections in mind at that time. Now it is the civic body elections. Mamta seems to have got her act together in terms of her moves in the arena of electoral politics. I just hope that the voters get their act right some day and hand out to her what she deserves. A resounding defeat. The British parliament election results are out and everybody there appears to be perplexed. A hung parliament has emerged from the ballot boxes, and the last time something like this happened there was 36 years ago. So what? All they need to do is look at how Indian politicians have tackled this with consummate ease. A hung parliament has never been a deterrent for our leaders. They have been able to change their colours of loyalty faster than a chameleon. All that it takes is to follow the rule of four Ds. Here's a simple guide. 1. Defect - The simplest of all techniques. 2. Defy (the voters, that is) - What we said before the polls is a matter of history. We can always change to some other agenda. Even give it a politically correct name of 'Common minimum program'. 3. Deny - That you said something before the polls. Statements like 'there is no question for forming an alliance with XYZ' have to be forgotten and any alliance can then be defended by saying 'politics has strange bedfellows'. 4. Dogged pursuit - of power, what else. The British could have learned something from a country that they ruled for so long. Maybe we can send a delegation of our politicians there , headed by people like Mayawati, Laloo, Ramadoss, Mamta and of course, Amar Singh. They can solve the problem of 10, Downing Street in a matter of minutes. Another chance to show that Indians are going to rule the world! 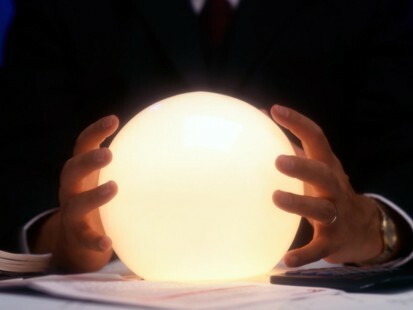 The crystal ball didn't lie, after all. With some variations here and there, many of the predictions in my earlier post turned out to be true. Unfortunately, I don't know whether to feel happy or sad about this. When one's prediction of a ridiculous and totally avoidable event turns out true, what does one do? In all the mayhem on TV channels following Kasab's verdict, I would like to focus on that part which came as a surprise to me. The big moment, as touted by all channels, the announcement of the verdict, was anchored on NDTV by Nidhi Razdan. Whether this was by design or some divine intervention, I was glad that the most sensible anchor on NDTV handled this part. All other channels without exception went berserk. NDTV's late night show on 'Your verdict' anchored by Sonia Singh featured interviews of Major Sandeep Unnikrishnan's father, Shantanu Saikia (husband of Sabina Saikia, who was one of the victims of attack on Taj) amongst others. I was left dumbstruck to hear Shantanu's views. I am still to get over it completely. After the day-long tamasha on all channels, his fortitude and grace were touching and inspiring. I can only quote him ad verbatim. "This is really a personal matter. Me and my sons have forgiven Kasab long back. That was the only way we could survive. I do not wish that my sons grow up to think like terrorists do. An eye for an eye will not bring Sabina back. Our country is in the throes of social and economic upheaval, and this is the time for us to sit back and think in quiet dignity. I am neither happy nor sad at the death sentence." No words can encompass the gravity, the enormity of this sentiment. I can only bow to Shantanu and his family for the stance that they have taken. I don't claim to be a fortune teller, but this time around, I have decided to look into the crystal ball. So, what will happen to news channels in India tomorrow.....? Here's my prediction. By 10 am, all channels would have aired (32 times, at least) a shot of the army of cops outside Arthur Road jail. By 11.30, the news will erupt. Judge Tahiliyani will pronounce death sentence to Kasab for 3 out of 86 charges, life imprisonment for 36 out of the remaining 83, and rigorous imprisonment of 10 years for the remaining 47. And all hell will break loose. कसाब को फांसी . Kasab gets death sentence. News for Kasab. Sorry, noose for Kasab. छब्बीस ग्यारह के आतंकी को मौत का फरमान. Etc. etc. etc. By 4 pm, all channels would have sent their junior reporters to go and interview every person that they can find on the face of earth. India TV will show Judge Tahiliyani's dog frantically wagging his tail. 'टौमी ने भी अपनी ख़ुशी जाहिर की'. By 6 pm, the channels will have caught hold of most politicians. They will be able to do this only now, since most of the politicians will be busy shouting in the parliament till then. By 9 pm, Arnab Goswami will be foaming at his mouth, Barkha Dutt will be in fits, and Rajdeep Sardesai will be speechless. Because he would have shouted so much since evening. I hope he keeps a lot of cough lozenges with him. After all, we are all entitled to some entertainment, aren't we? By 11 pm, all channels will be asking - what next? Will Kasab become another Afzal Guru? And how can I forget. On IBN-Lokmat, Nikhil Wagle will have dislocated his elbow and shoulder joints by now due to his incessant and frantic gesturing. And thus will end another day in the history of Indian news channels. Note - As I type this, I completely feel the pain of each person who has lost a dear one in the carnage of 26/11. Kasab must be punished, no two ways about that. My intention is not to ridicule the Kasab trial. I am only commenting on how the news channels will respond. Funny notices and road signs have made frequent appearances on my blog. I was amazed to notice a spelling error that I had missed for several months, in spite of being right in front of my eyes all along. 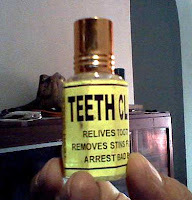 This is a bottle of Teeth Cleaning Oil (yes, I know I run the risk of being disowned by my dentist friends) which makes several claims. 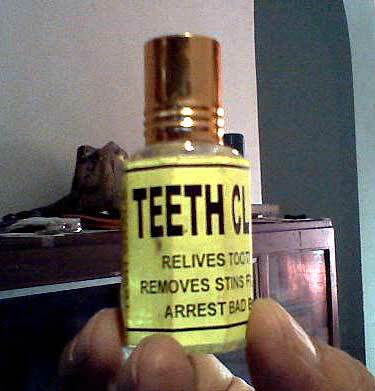 The first one is 'Relieves tooth ache'. At least, that's what its supposed to say. Remarkably, it actually says 'Relives Tooth Ache'. Should I be relieved? It also goes on to say in a reassuring manner that it (relives) 'Bad Odur', 'Removes stins from teeth' and also 'Arrest bad blood form gums. There is a Gujarati proverb that says 'Jeno kaam teno thaay'. Simply put, it says one should do take up only those tasks that one can. This might sound like rather pessimistic and is likely to be looked down upon by motivational speakers. After all - they always tell people that human potential is unlimited and if you plan right, then anything is possible. I am sorry to inform them - anything is NOT possible. OK, I am referring to the program that is aired on ESPN/Star as part of their telecast of World T20. It is anchored by Cyrus Broacha and Shonali Nagrani. (Shonali who? Never mind.... read on if you wish.) After the recently concluded IPL T20 tamasha, this show is a let-down. It comes nowhere close.